While the lights came on for most of the East Village Friday, and bars and restaurants wasted no time breaking out the bubbly, many in the neighborhood are complaining they’ve been left in the dark – and the cold. Several apartment buildings and at least one restaurant were still without power on Avenue C and in Peter Cooper Village and Stuyvesant Town this evening, and many others had no heat or hot water. Around 6 p.m., seven workers were standing around a manhole on Avenue C near Eighth Street — their thirteenth job of today — waiting for the water to go down so they could check the lines. They had pumped out a little over four feet of water with about a foot more to go. 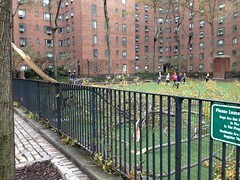 Daniel Maurer In Stuy Town, kids play soccer near downed tree. Workers are also going from block to block and into meter cabinets to see if breakers or meters are damaged. Mr. Vaeth hoped the power would be on by the end of this weekend, but he admitted, “We’re going to be here for a while.” His crew was joined by workers from Duke Energy, an electric company in Cincinnati, Ohio, also trying to help troubleshoot problems. More than 2,000 utility workers from as far away as California are working in New York City and Westchester County, according to Con Ed. Electricity returned to Zum Schneider, at 107 Avenue C, around 2 p.m. today, said Sylvester Schneider, the owner. “I’m excited the power is back on,” he said, “The downside to it is we’ve found out what’s working and what’s not.” The big discovery: his two main refrigerators are dead. Zum Schneider was open for business as of yesterday afternoon and relied on generators for evening light. 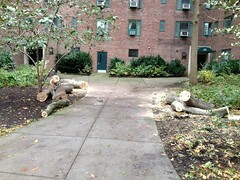 Daniel Maurer Tree damage in Stuy Town. John Coca, a resident of the Jacob Riis Houses on East 12th Street and Avenue D, said his power returned yesterday evening. But while he had hot water, he had no heat. According to Mr. Coca, who is renovating Babel Lounge and Hookah Bar on Avenue C, which had power, a landlord has to hire someone from a private company to make sure it’s safe to turn on a boiler. This evening, the apartment building at 133 Avenue C had no power, no heat, and no hot water, while the apartment building at 129 Avenue C had power, no heat, and no hot water. There was a mishmash of lighting in the vicinity: some buildings on Avenue C had power in the stairwells, others did not. Ashley Tucker’s apartment building on Avenue C and East Eighth Street had no power, but the lights were on in the hallways. Her heat was turned on today, but she had no hot water. Ms. Tucker, a second-year student at CUNY School of Law was on her way to a neighboring friend’s fully powered apartment to do her coursework. “I can’t do it by candlelight,” she joked. 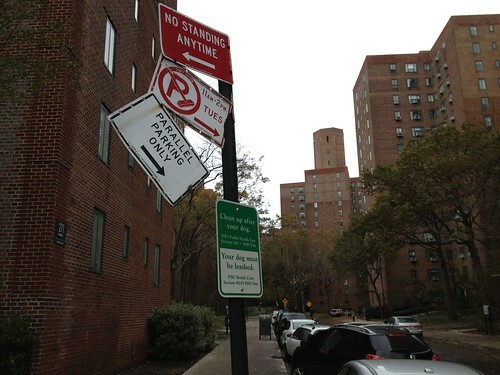 Shortly after 6 p.m. today, Peter Cooper Village and Stuyvesant Town announced that it had restored electricity to 37 buildings, with 17 buildings expected to regain power sometime in the next 48 hours. 31 buildings were expected to regain heat within six days, and 31 were expected to get hot water again in the same time period. A handful of buildings were still without cooking gas. Con Edison said its steam system, which brings heat and hot water to many buildings, was badly flooded below 14th Street, but it hoped to fully restore service by Nov. 11, with systematic restorations beginning tomorrow. In the meantime, with temperatures dropping, the city opened overnight warm shelters for residents without heat. Correction Nov. 8, 2012: The original version of this post was revised to reflect an error. John Coca is renovating Babel Lounge and Hookah Bar but is not the owner.